Introducing a new line of organic snacks specifically created to answer the call of your cravings, whatever they may be. 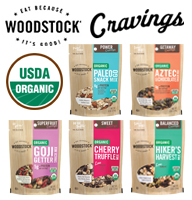 If it’s something nutritious or just downright delicious, WOODSTOCK® Cravings has exactly what you’re looking for. Whether you’re hitting the gym, dreaming of a tropical beach, or need that 3pm pick-me-up, we have five reasons to give into your craving. 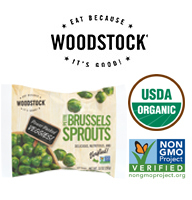 WOODSTOCK® is pleased to announce our new Frozen Organic Brussels Sprouts available in a 24oz convenient, resealable, and stand-up bag. Perfect by itself or in your favorite recipes. 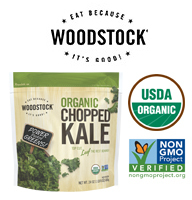 Our new Frozen Organic Chopped Kale is now available in a convenient 24oz bag. It's great for smoothies and any holiday recipe! 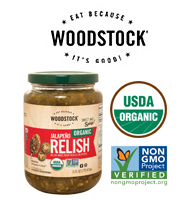 Our kale is Non-GMO Project Verified, rich in Vitamin A and a good source of Vitamin C.
A new, one-of-a-kind relish for your shelves...a relish with no pickles! Our Organic Jalapeño Relish kicks it up a notch to create the perfect blend of sweet and spicy and adds incredible flavor to any dish! Don’t be shy, give it a try! 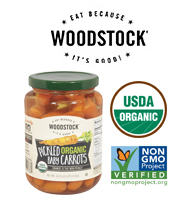 New Organic Pickled Baby Carrots! These babies will add a sweet little crunch to any of your recipe favorites. They won’t be around for long, so order now, before it’s too late! 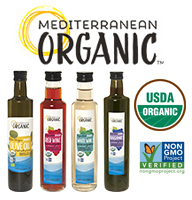 Introducing Mediterranean Organic™’s new gourmet olive oil and vinegars! Our Extra Virgin Olive Oil is first cold pressed and imported from Spain along with our Red and White Wine Vinegars. Our Balsamic Vinegar is imported from Modena, Italy, for true authentic flavor. Organic, gourmet, pantry essentials! 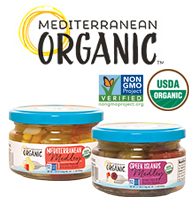 Our Mediterranean Medley and Greek Islands Medley are delicious blends of fragrant herbs, sunflower and extra virgin olive oil, roasted peppers and more! Each uniquely created to top off your next meal. Perfect for salads, pasta and more! 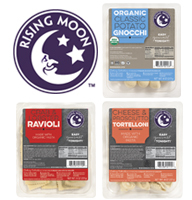 Rising Moon™ New look and Gourmet Products! Rising Moon™ is excited to announce our brand new look and 9 brand new items! Now offering new protein options, gluten-free gnocchi, and the same certified vegan selection for the entire family to enjoy. Ready in 6 minutes for Easy, Gourmet, Tonight! 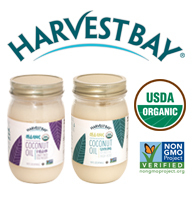 Harvest Bay®’s new Organic Coconut Oils are nature’s best cooking coaches! Our Organic Unrefined Coconut Oil is cold pressed with a rich taste and aroma of coconut and perfect for medium heat cooking or to enjoy the natural hydration benefits for your skin and hair! Our Organic Refined Coconut Oil is great for high heat cooking and has a light, neutral flavor that makes for a healthy alternative to butter and traditional oils! At Field Day® we strive to offer you everyday items that are organic, delicious and genuinely simple. Take a look at some of the new items we introduced this year!  Blue Marble Brands is an industry leader in on-trend USDA Organic, Non-GMO, clean, specialty and gourmet foodservice ingredients and products. Our specialized portfolio is competitively priced, nationally distributed, and features consumer driven attributes that stand out on a menu. We are proud to source items that meet our four different ingredient standards.